A quick and comical read, rife with sarcasm. A particular plankton is used to eliciting a response from every sea creature it encounters. So when a mulish muscle refuses to respond to its greeting, the plankton can’t just let it go. First the plankton gets louder. Then it tries persistence. When that doesn’t pay off, it progresses to impatient prompting. And then begging, followed by condescension. In the end, Plankton receives a snappish lesson in social graces. 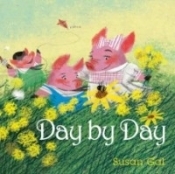 The book’s artwork is vivid, cartoonish, and playful—full of demonstrative poses and expressions on simple near-pastel backgrounds that will clearly convey emotion to even the youngest range of readers. The font is large and sparsely spaced out, making it more ideal for the earliest readers, but with a “biting” humor older kids may better grasp. All in all, a potential visual training aid for kids who have trouble knowing when to leave well enough alone. Painlessly humorous for parents!